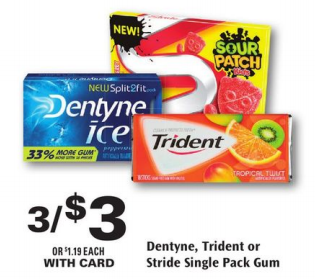 Trident, Dentyne, or Stride Gum Just $0.66 at Rite Aid! You are here: Home / Great Deals / Trident, Dentyne, or Stride Gum Just $0.66 at Rite Aid! Calling all gum fans! This week you can snag Trident, Dentyne, or Stride Gum for just $0.66 at Rite Aid! This is a great time to stock up!